I have used a Wireless RF Shutter Release for still photography. The more I use the Canon 7D for video, the more I would love to have a remote to start and stop the video recording. I tried my wireless remote, but it only triggers the shutter release. After some experimenting, it really does work. In fact, the Canon 5D Mark II should work in a similar fashion. Must be used from the front of the Canon 7D. Short range of approximately 5 feet. The RC-1 is an InfraRed remote which means it has a short range and can be fussy. Considering how popular the Canon 7D and the Canon 5D Mark II are for recording video, I hope that Canon releases a better solution. Until then, give it a try if you can find it. The RC-1 is usually in short supply and falls into backorder status frequently. I called my sales rep at Adorama and was told that Canon has shipped their order and they should receive it by Friday. Otherwise, you can try B&H but they just listed it as out-of-stock. Seems Adorama is still your best bet. But, remember, it is ONLY the real Canon RC-1 which works as outlined on this page. Do NOT buy a substitute or 3rd-party remote and expect it to work. I’ve just got my hands on an Opteka RC-4 and saw your blog while trying to figure out how to get it to work. Pressing the S2 (2 sec delay) button does indeed start and stop recording! Drive control set to either self-timer mode works, as long as the camera is of course already in Video mode. Thanks for the post! I am glad to hear that the Opteka RC-4 works. Canon’s RC-1 bizarrely goes out of stock periodically. It is good to hear that there is an alternative. I would love to hear the range of the Opteka remote. – The range is very limited, officialy no more than 5 meters. In my first test, no more than 3 meters. – The angle is also very limited, the RC has to be IN FRONT of the camera. – You have to enable RC-drive mode everytime you want to use it. That said, I think it’s a good way of minimizing movement of the camera for static shots. It probably is the same unit. Opteka is probably the US Brand. Thanks for posting about Jianisi! Glad to hear it also controls the video recording. It is certainly better than being stuck to button to record. It says that it needs “line of sight” to operate. Is it using InfraRed? But, I would hold-off buying a new remote. There is a rumor that Canon is planning to release a new remote in the Fall. THANK YOU SOOOO MUCH! I just received the Opteka remote for my new Canon Rebel T3i and couldn’t figure out how to get the video to start and stop recording with the remote control. I found your post and set my camera to AF Live. Went into the Menu (while in movie mode) and had to enable the “Remote control” feature and that’s it! When you press the “S” it will take a picture. But when you press the “2S” button on the remote it starts recording video! Thank you!! Got a hanhel pro remote control that only works to release the shutter! Works perfect long range but it’s not starting the video start/stop no metter what switches i set on it. Amazon had a SHOOT remote that excepting the name is identical to the Opteka RC-4 Wireless Remote for $4.00. Following your instructions above face recognition setting @/2 sec. the SHOOT works perfectly for either single shots or movie mode. In movie mode you’d trigger the “2S” button adjacent to the “S” button on the SHOOT. Meant to say this was using the SHOOT with the 7d. That’s for the info on the SHOOT remote! It even looks like the Canon RC-6 remote. That’s a $4 bargain! I’m doing aerial videography and need to trigger my 7D to shoot video from ~10 feet away in a closed compartment of the aircraft. Is there any kind of wired remote or non-IR wireless system that will allow me to do this? Stills yes, video no. The only way to trigger video remotely is to use the Canon RC-1 mentioned in the article. (There are a few third-party work-a-likes than mimic the RC-1). But, all are short-range infrared which must have a line-of-sight with the camera’s built-in sensor. B&H just introduced a new line of remotes which work with the Canon 7D for still photography only and does include a wireless remote which is rated up to 250 feet. As for cabled remote video shooting, you could use the Canon EOS Utility running on a laptop with their 15-feet mini-usb/USB cable (Canon IFC-500U cable). This will work. Just tape all connections to be sure that they do not vibrate loose. And, remember, there is a 4GB file size limitation for continuous video which is about 12 minutes at 1080p. You will need to stop the video at that point, pause for the camera to complete the file and then start recording video again. Another cabled option would be OnOne’s DSLR Camera Remote for the iPhone/iPad/iTouch. (It also claims to work using the 7D’s WFT-E5A Wifi enabled battery grip but I have never tested it. Canon Gold CPS claims that the WFT-E5A was not designed to transfer the video files and was uncertain about triggering the video recording through the OnOne App. You will need to contact OnOne for clarification.) There is an Android App currently in beta called “DSLR Controller” by Chainfire but it requires either Android 2.3 or 3 running on an Android device which supports “USB Out” for cabled connection. However, the App does not currently work for video. OPteka works fine with Video. I tried up to 10 feet. 2S button triggers the video on and off. 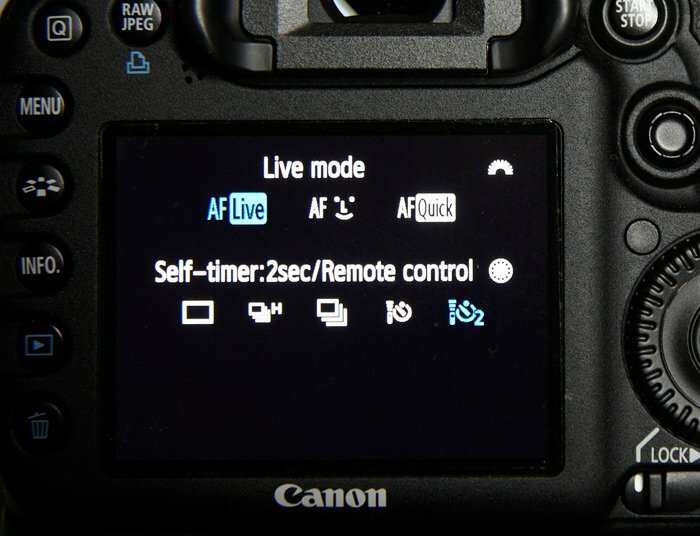 On AF-drive on 7d choose remote control function and fire away.